TEOS Powertrain Engineering is committed to the sustainable development of powertrains, aiming to develop more efficient and less fuel consuming propulsion systems, preserving the environment. It is of common knowledge that hybrid and electric propulsion systems represent a breakthrough in this direction. The evolution of electric machines used in transportation goes towards more compact and lighter systems. This means high-speed machines, with an increasing need for an efficient speed reduction to connect with the driven systems. 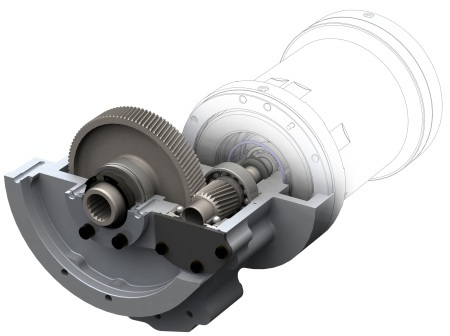 As a vivid example of TEOS' advanced technologies, TEOS has developed a high-speed gear reducer to connect a 30 000 rpm electric motor. TEOS' innovative gear reducer is perfectly designed for electric machines. Robust and compact design, it could fit in applications such as automotive industry (traction) and aeronautics (propulsion, generator unit). In order to demonstrate the capabilities of its gear reducer, TEOS has selected the Renault Twizy electric urban car. A high-speed permanent magnet / reducer unit is used to drive the car with tremendous improvement in performance compared to the original model.